Many of us spend more time flying than we had ever dreamed possible, and most of us are not too happy about it. Being in the AV industry, I ask myself what has happened to the "elixir" we have been told will solve this? Of course I am speaking of videoconferencing. I wish I could tell you that all is well and a real solution is on the horizon, but it's not that simple. But things are getting a lot better and there are some products to help keep us out of that dreaded "aluminum tube." Being more than a little skeptical and a lot tired of flying, I thought I would search for a bright spot. To my happiness and, to be honest, my surprise, I did find a bright spot from Polycom. Videoconferencing has been a tough sell because, until recently, it just did not work as we had all hoped and, frankly, as we had been told by an eager group of manufacturers - especially in the early days. The video was horrible and audio was not properly sync'd to the video. And we could really only see the face of the person we were talking to. Heaven forbid if we wanted eye contact or to see real body language, which comprises 60 percent of communication. Last but not least, these systems required an attendant or AV technician on call at all times to help make the systems work. Sound familiar? Recently, I was invited to Polycom to conduct a training course for them on display calibration. After delving into my concerns on why videoconferencing does not perform as I - and a lot of people - think it should, I said, "Show me what ya got!" They smiled graciously and led me into a room that had the appearance of a state-ofthe- art home theater. The room was a tiereddesign for better viewing by a larger group - even as users walk to the second or third tiers, they are seen in full height. The height of the displays preserves the virtual room connection. In front of me was a seamless panoramic screen about 3.5 feet high by 16 feet wide. Then, one of my hosts simply touched a button and up popped the display in all its splendor and glory. Another button was pushed that connected us to the "far end" videoconferencing system, and a person on the other end engaged my compatriots and me in conversation. It actually appeared as though his eyes really met mine and shifted to others in our group as he interacted with them. The voice was properly sync'd and appeared to come from the proper direction of all the people talking during the conference. The images and participants were full size, and we could all see every movement on both ends. There was full engagement and was as close to being there as possible, considering we were not in the same room. From a technical perspective, high definition video is captured through fixed 3-CCD HD cameras, and the displays are comprised of large-format 48- by 42-inch rear projection designs. The audio is just as impressive. Stereo surround audio at 22 kHz is natural, open in quality, and is accurately synchronized with the picture to give what Polycom calls "spatial reference to voices across the suite." 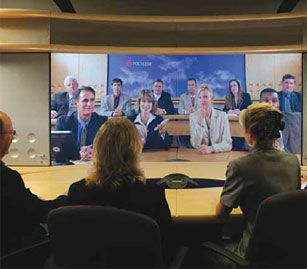 The Polycom RPX HD Suites are completely interoperable with all standards-based videoconferencing products, ensuring that end users can maximize their capital investment and continue to use legacy video solutions. Of course, we would be remiss if we did not mention bandwidth, which is the "holy grail" of facilitating the performance of the system. You have choices when it comes to setting up the network needed for the system. You can section off a slice of bandwidth from your existing infrastructure or you can install a separate network to support the RPX suite. The good news is that bandwidth prices are coming down and we expect more of a decline in the near term, thus facilitating the TCO of this type of installation. There are a multitude of other features and benefits too numerous to mention, but suffice it to say that this system was like a virtual toy store for those who thirst for effective communication and collaboration over long distances without leaving their offices. Of course, I asked about integration, and the Polycom answer was interesting to say the least in our world of customized integration projects. "The product arrives complete with everything required for a dramatic Real Presence Experience with no additive equipment or room treatments needed. The walls, tables, chairs, carpeting, lighting, AV components, programmed touchpanel, and content displays are all included in a single package." In short, they take care of it all, and the finger points only at them. There is an old axiom that says, "It ain't bragging if you can do it," and Polycom showed me they can do it with their RPX system. Now we just need to scale down the technology and make it more affordable to the masses. Alan Brawn is a principal of Brawn Consulting, an audiovisual consulting, educational development, and market intelligence firm. He is also an adjunct faculty member of InfoComm and an NSCA instructor and Learning Unit provider, and can be reached atalan@brawnconsulting.com.